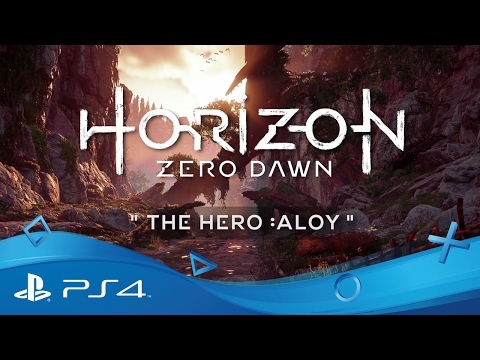 Introducing Aloy, the star of this incredible adventure. Shunned by her tribe since birth, Aloy has never known a mother’s embrace or the acceptance of a community. Her only companion was Rost, the stern, impassive recluse who fostered her. Rost taught Aloy to survive any physical hardship and to scorn comforts as weakness – but he couldn’t provide the answer to the questions which troubled her above all else: who her parents were, and why she was cast out. Now, on the brink of adulthood, those answers may finally be within her grasp. But to unravel the secrets surrounding Aloy, she must leave her training behind and venture into the wider world, where unknown tribes rule and new threats rise. Aloy will have to dig deep to survive, drawing on her sharp insight, keen intelligence, inventive crafting, and above all, her skill with bow and spear against powerful Machines and deadly warriors. These abilities, combined with her relentless drive to uncover the truth, propels Aloy from the personal riddle of her origins into a wilderness of wider mysteries: How did the Machines come to be? What became of the Old Ones? Could the catastrophe that turned their cities to graves again come to pass? A soft-spoken brave of the Nora tribe, Varl has had to content with being the son of Sona – one of the greatest heroes the tribe has ever known and its iron-willed War Chief. Along with his sister Vala, Varl has rarely seen positive encouragement from his mother, who deemed excellence was its own reward… and attainable to a very few. Haunted by his father’s terminal alcoholism and poor leadership, Erend has watched the Oseram clan broken by vicious infighting. And while this legacy saw his sister Ersa fight hard for a better life, Erend’s feelings grew into a powerful hatred of his father’s failings… and the creeping fear that he is doomed to repeat them, as he spirals into depression, self-destructive impulsiveness and excessive drinking. Called the “Terror of the Sun” by the other tribes and even his own soldiers, Helis is the leader of both the Shadow Carja rebellion and the Eclipse cult. Originally the most decorated soldier of the Carja Sundom, the fiercely determined Helis steadily moved up through the ranks, eventually gaining the attention of the mad Sun-King. Helis soon became the king’s unwavering and deadly right hand, garnering the label of the second-most hated man in the land… behind only his cruel and demented liege. Known as “the Dark Wanderer” by many, Sylens has become the subject of myth and legend across the known world. The few who have met him know only a handful of details about this warrior-sage: he is a Machine hunter without equal, his knowledge is all encompassing, he pays handsomely for obscure artefacts and Machine parts… and he kills without hesitation if you’re foolish enough to cross him.